The term UIP is often used interchangeably with idiopathic pulmonary fibrosis (IPF), but other clinical conditions are associated with UIP, although less commonly, including collagen vascular disease, drug toxicity, chronic hypersensitivity pneumonitis, asbestosis, familial IPF, and Hermansky-Pudlak syndrome. Thus, UIP is not entirely synonymous with IPF, and diagnosis of IPF requires an exclusion of possible underlying clinical conditions, as mentioned above. Usual interstitial pneumonia (UIP) is more common in men than in women. The cause of usual interstitial pneumonia (UIP) in patients with idiopathic pulmonary fibrosis (IPF) is unknown by definition (ie, IPF is defined as idiopathic UIP). Several associations have been identified, including cigarette smoking, gastroesophageal reflux disease, occupational exposure to wood and various other occupation-related dusts, Epstein-Barr virus, and hepatitis C virus. It has been postulated that no single etiologic agent serves as a common inciting event but rather that affected patients might have common defects in reparative pathways (ie, abnormal wound healing). Usual interstitial pneumonia (UIP) is more common in men than in women. Patients with UIP usually present in the sixth or seventh decade of life with slowly progressive dyspnea and nonproductive cough refractory to antitussive agents. Constitutional symptoms are unusual, and digital clubbing develops in 25%-50% of patients. Although not specific, velcro-type fine end-inspiratory crackles on chest auscultation are characteristic physical finding in nearly all patients. Features of right heart failure (cor pulmonale) and peripheral edema may develop usually in later stage of disease. Most patients display restrictive pulmonary function abnormalities, including reduced lung volumes with relative preservation of airflow, a reduction in the diffusion capacity for carbon monoxide (DLCO) with hypoxemia at rest and/or with exercise. A recent autopsy study suggested that acute exacerbation is a common cause of death in individuals with UIP. Acute exacerbation of UIP or IPF is first described and is defined as the sudden onset of rapid clinical deterioration without an identifiable cause. Proposed diagnostic criteria include (1) subjective worsening over 30 days or less, (2) new bilateral radiographic opacities, and (3) the absence of infection or another identifiable etiology. The relative role of imaging studies and surgical lung biopsies in patients with UIP has changed over the last decade. High-resolution computed tomography (HRCT) has greatly improved diagnostic accuracy over conventional chest radiography and has therefore revolutionized the role of radiology in managing patients with UIP, as well as with diffuse interstitial lung diseases in general. The most common chest radiographic abnormality in patients with IPF is peripheral reticular opacity, most marked at the bases, and often associated with honeycombing and lower-lobe volume loss (see image below). Chest computed tomography (CT) scan showing reticular densities and honeycomb changes. In patients with upper-lobe emphysema, the radiographic lung volumes may be normal or even increased. Chest radiographic findings are occasionally normal in patients with IPF. Ground-glass attenuation is common but usually less extensive than reticular abnormality. Architectural distortion reflecting lung fibrosis is often prominent. Lobar volume loss is seen with more advanced fibrosis. On serial scans, the areas of ground-glass attenuation may regress but more commonly progress to fibrosis with honeycombing. Honeycomb cysts usually enlarge slowly over time. HRCT in about half of patients shows a characteristic combination of peripheral, subpleural, irregular linear, or reticular opacities involving predominantly the lower lung zones with associated architectural distortions in the form of traction bronchiectasis and bibasilar honeycomb change. Radiologically, cases associated with asbestosis or collagen vascular disease may show the lung parenchymal CT pattern of UIP indistinguishable from that caused by IPF. However, the presence of pleural plaques or diffuse pleural thickening could help to distinguish asbestosis from IPF. In rare cases, patients with chronic hypersensitivity pneumonitis (HP) or with end-stage sarcoidosis develop a CT pattern similar to that of UIP. The presence of poorly defined fine micronodules or sparing of the lung bases would favor the diagnosis of HP. 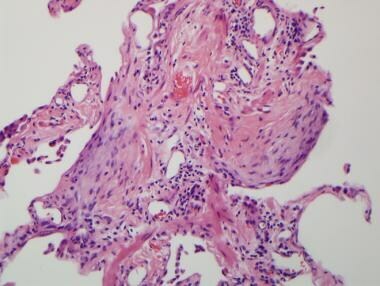 A possibility of sarcoidosis should be suspected if the cysts are large or if peribronchovascular nodules are present. Lung transplantation is used in some cases, but its application is limited owing to the older age and frequent comorbidities in affected patients. In most patients, UIP follows a progressive course, with median survivals from the time of diagnosis of about 3 years. Whole lungs demonstrate honeycomb change affecting predominantly peripheral and lower lung zones (see image below). The pleural surface shows a cobblestone appearance due to the retraction of interlobular septa-associated paraseptal scarring. 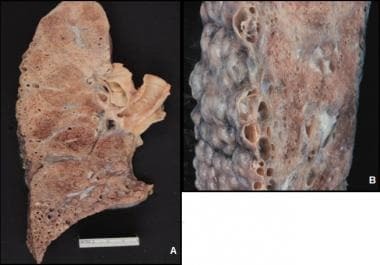 Gross photographs of UIP-associated lung. Honeycomb change along the periphery and lung bases (A). Prominent cobblestone appearance of the pleural surface (B). 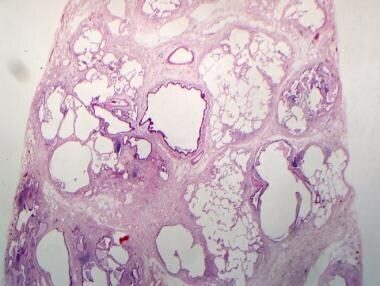 The key histologic features of usual interstitial pneumonia (UIP) include a heterogeneous or variegated appearance resulting from irregular juxtaposition of fibrotic scarring, honeycomb change, interstitial inflammation, and normal lung (see image below). Scanning power of the section demonstrates patchy interstitial fibrosis with juxtaposition of relatively preserved lung tissue with fibrotic and honeycomb changes (hematoxylin and eosin stain, 12.5X original magnification). This distinctive appearance due to alternating areas of qualitatively different abnormalities is the key to the diagnosis of UIP. As is in imaging studies, the distribution of fibrosis is more prominent at the periphery and bases of the lung. Fibrosis predominates over inflammation in typical UIP and comprises mainly dense eosinophilic collagen deposition. In this background of chronic fibrosis, there are fibroblastic foci in which fibroblasts and myofibroblasts are arranged in a linear fashion within a pale staining matrix (see image below). Fibroblastic foci characterized by dome-shaped fibroblastic tissue over collagen fibrosis (hematoxylin and eosin stain, 200X original magnification). Overlying epithelium consists of hyperplastic pneumocytes or columnar nonciliated bronchiolar cells. Fibroblastic foci are not specific for UIP but are a characteristic and important feature in establishing the diagnosis. Honeycomb change is present in most surgical lung biopsy specimens and is another important diagnostic feature. 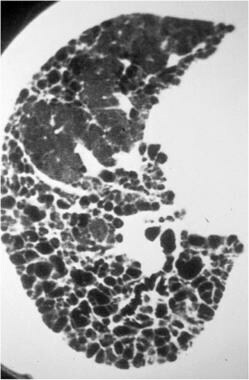 Honeycomb change is defined by cystically dilated airspaces frequently lined by columnar respiratory type epithelium in scarred fibrotic lung tissue (see image below). Honeycomb change showing cystic dilatation of air spaces lined with columnar type of epithelium (hematoxylin and eosin stain, 40X original magnifications). Fibrotic scars that obscure the underlying lung architecture without associated honeycomb change are another form of architectural distortion characteristic of UIP. Smooth muscle hyperplasia is commonly seen in the areas of fibrosis and honeycomb change and can be quite striking in some areas. Liebow has described those findings as "muscular cirrhosis" of the lung. The prognosis of interstitial pneumonia (UIP) is grim, with short-term mortality rates in excess of 50% in most reported series. [4, 5] In most patients, UIP follows a progressive course, with median survivals from the time of diagnosis of about 3 years. The natural history of idiopathic pulmonary fibrosis (IPF) has been known as a steady decline in lung function over time without a response to medical therapy. However, the clinical course of IPF is not always predictable despite its generally poor prognosis. Differential diagnoses of usual interstitial pneumonia (UIP) must be approached in two ways: histologically and clinically. 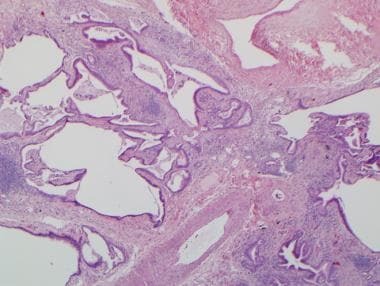 In interpreting lung biopsies histologically, pathologists must address the differential diagnoses based on the histologic pattern. Histologic clues should be sought to a potential underlying condition such as asbestos bodies, infectious agents, or other exogenous agents. For clinical aspects, clinicians must address the etiologic possibilities and ultimately determine whether the process is idiopathic. Histologic differential diagnoses of UIP include other patterns of interstitial pneumonias, including fibrosing nonspecific interstitial pneumonia (NSIP), desquamative interstitial pneumonia (DIP), and AIP. Distinguishing UIP from these conditions depends mainly on recognition of characteristic patchy distribution of fibrosis, fibroblastic foci, and honeycomb change typical of UIP. Differentiating fibrosing NSIP from UIP is perhaps the greatest challenge. Areas indistinguishable from DIP may occur focally in otherwise typical UIP, and correlation with the findings on HRCT would be very helpful in that setting. It has been noted that areas typical of NSIP can occur focally in other conditions, making sampling bias a potential barrier to accurate diagnosis. In a review of 20 explanted lungs with UIP, all but 3 showed isolated areas that were indistinguishable from NSIP. Other studies have shown that the presence of UIP in even a single piece of tissue defined a survival curve typical of idiopathic pulmonary fibrosis (IPF) in patients from whom surgical lung biopsy specimens taken from more than one site demonstrated both UIP and NSIP (discordant UIP). Therefore, it is very important to consider the sampling bias and clinical radiological correlation. Occasionally, OP and DAD mimic UIP and also could be superimposed on underlying UIP with clinical manifestation of acute exacerbation. OP does not have significant interstitial fibrosis, which would be an important feature in distinguishing bronchiolitis obliterans organizing pneumonia (BOOP) from UIP. Finally, AIP (mainly showing features of organizing DAD and some scarring) can be difficult to distinguish from UIP, but the clinical and radiologic findings would be of great help. With the current definition of UIP, only a few clinical conditions may cause an identical histologic pattern of UIP: collagen vascular disease, drug toxicity (especially nitrofurantoin), chronic HP, asbestosis, familial IPF, Hermansky-Pudlak syndrome. Distinguishing UIP in patients with other underlying or associated conditions is largely a matter of correlation with clinical information. The presence of asbestos bodies in a background of UIP is diagnostic of asbestosis in a patient with a well-documented exposure history. Cytoplasmic vacuolization in hyperplastic pneumocytes with pigmented alveolar histiocytes is a helpful histopathologic clue to the diagnosis of Hermansky-Pudlak syndrome, a condition seen in patients with oculocutaneous albinism. Chronic HP can mimic UIP and may be indistinguishable from UIP. HP tends to be more cellular and bronchiolocentric. Peribronchiolar infiltrates in HP demonstrate varying degrees of granulomatous inflammation in most cases, usually in the form of isolated multinucleated giant cells or ill-defined clusters of epithelioid histiocytes. Honeycomb change can occur in HP but typically is not associated with the peripheral subpleural distribution as would be seen in UIP. Langerhans cell histiocytosis (LCH) also tends to have a distinctly bronchiolocentric distribution. These bronchiolocentric nodules of LCH have stellate configuration and show variable degrees of cellularity and fibrosis. The cases in which fibrotic nodules predominate may be difficult to distinguish from UIP. Again, the key features are stellate configuration and bronchiolocentric distribution of the nodules in LCH, coupled with often striking paracicatricial airspace enlargement. Fibroblast foci are also uncommon in purely fibrotic nodules in LCH. HRCT scans can be very useful in distinguishing LCH from UIP in diagnostically challenging cases, as well. What is usual interstitial pneumonia (UIP)? How is usual interstitial pneumonia (UIP) defined by the ATS/ERS? What is the prevalence of usual interstitial pneumonia (UIP)? What causes usual interstitial pneumonia (UIP)? Which clinical history findings are characteristic of usual interstitial pneumonia (UIP)? Which imaging results are characteristic of usual interstitial pneumonia (UIP)? How is usual interstitial pneumonia (UIP) treated? Which gross findings are characteristic of usual interstitial pneumonia (UIP)? Which histologic findings are characteristic of usual interstitial pneumonia (UIP)? What is the prognosis of usual interstitial pneumonia (UIP)? What is the prognosis of usual interstitial pneumonia (UIP) with pulmonary hypertension (PH)? Which conditions are included in the histologic differential diagnosis of usual interstitial pneumonia (UIP)? American Thoracic Society/European Respiratory Society International Multidisciplinary Consensus Classification of the Idiopathic Interstitial Pneumonias. This joint statement of the American Thoracic Society (ATS), and the European Respiratory Society (ERS) was adopted by the ATS board of directors, June 2001 and by the ERS Executive Committee, June 2001. Am J Respir Crit Care Med. 2002 Jan 15. 165(2):277-304. [Medline]. Scott J, Johnston I, Britton J. What causes cryptogenic fibrosing alveolitis? A case-control study of environmental exposure to dust. BMJ. 1990 Nov 3. 301(6759):1015-7. [Medline]. Kondoh Y, Taniguchi H, Katsuta T, Kataoka K, Kimura T, Nishiyama O. Risk factors of acute exacerbation of idiopathic pulmonary fibrosis. Sarcoidosis Vasc Diffuse Lung Dis. 2010 Jul. 27(2):103-10. [Medline]. Collard HR, Moore BB, Flaherty KR, Brown KK, Kaner RJ, King TE Jr. Acute exacerbations of idiopathic pulmonary fibrosis. Am J Respir Crit Care Med. 2007 Oct 1. 176(7):636-43. [Medline]. Hyzy R, Huang S, Myers J, Flaherty K, Martinez F. Acute exacerbation of idiopathic pulmonary fibrosis. Chest. 2007 Nov. 132(5):1652-8. [Medline]. Daniels CE, Yi ES, Ryu JH. Autopsy findings in 42 consecutive patients with idiopathic pulmonary fibrosis. Eur Respir J. 2008 Jul. 32(1):170-4. [Medline]. Kondoh Y, Taniguchi H, Kawabata Y, Yokoi T, Suzuki K, Takagi K. Acute exacerbation in idiopathic pulmonary fibrosis. Analysis of clinical and pathologic findings in three cases. Chest. 1993 Jun. 103(6):1808-12. [Medline]. Flaherty KR, Thwaite EL, Kazerooni EA, Gross BH, Toews GB, Colby TV. Radiological versus histological diagnosis in UIP and NSIP: survival implications. Thorax. 2003 Feb. 58(2):143-8. [Medline]. Burdick MD, Murray LA, Keane MP, Xue YY, Zisman DA, Belperio JA. CXCL11 attenuates bleomycin-induced pulmonary fibrosis via inhibition of vascular remodeling. Am J Respir Crit Care Med. 2005 Feb 1. 171(3):261-8. [Medline]. Flaherty KR, Colby TV, Travis WD, Toews GB, Mumford J, Murray S. Fibroblastic foci in usual interstitial pneumonia: idiopathic versus collagen vascular disease. Am J Respir Crit Care Med. 2003 May 15. 167(10):1410-5. [Medline]. Hanak V, Ryu JH, de Carvalho E, Limper AH, Hartman TE, Decker PA. Profusion of fibroblast foci in patients with idiopathic pulmonary fibrosis does not predict outcome. Respir Med. 2008 Jun. 102(6):852-6. [Medline]. Nadrous HF, Pellikka PA, Krowka MJ, Swanson KL, Chaowalit N, Decker PA. Pulmonary hypertension in patients with idiopathic pulmonary fibrosis. Chest. 2005 Oct. 128(4):2393-9. [Medline]. Kim KH, Maldonado F, Ryu JH, Eiken PW, Hartman TE, Bartholmai BJ. Iron deposition and increased alveolar septal capillary density in nonfibrotic lung tissue are associated with pulmonary hypertension in idiopathic pulmonary fibrosis. Respir Res. 2010. 11:37. [Medline]. Behr J, Ryu JH. Pulmonary hypertension in interstitial lung disease. Eur Respir J. 2008 Jun. 31(6):1357-67. [Medline]. Flaherty KR, Travis WD, Colby TV, Toews GB, Kazerooni EA, Gross BH. Histopathologic variability in usual and nonspecific interstitial pneumonias. Am J Respir Crit Care Med. 2001 Nov 1. 164(9):1722-7. [Medline]. Katzenstein AL, Zisman DA, Litzky LA, Nguyen BT, Kotloff RM. Usual interstitial pneumonia: histologic study of biopsy and explant specimens. Am J Surg Pathol. 2002 Dec. 26(12):1567-77. [Medline]. Lagstein A, Myers JL. Common diagnostic challenges in the pathology of nonneoplastic lung diseases: a case-based review. Arch Pathol Lab Med. 2009 Nov. 133(11):1782-92. [Medline]. Journal Article Is It Idiopathic Pulmonary Fibrosis or Not?